Quiet, decorously polite, shamanistic Alex Grey met me at the door of his Brooklyn loft studio. With long graying hair like an Indian chief, thin compassionate face with luminous skin, and blue-gray eyes suggesting depths of experience, here was a person I was fascinated to meet, an explorer, experimenter, craftsman, and teacher on the path of art. 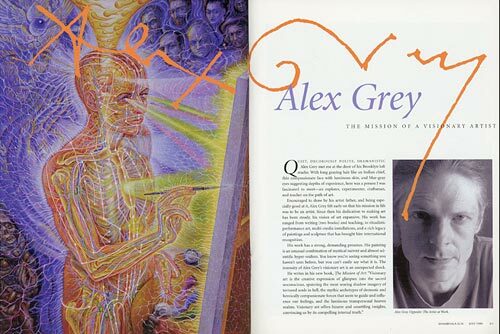 Encouraged to draw by his artist father, and being especially good at it, Alex Grey felt early on that his mission in life was to be an artist. Since then his dedication to making art has been steady, his vision of art expansive. His work has ranged from writing (two books) and teaching, to ritualistic performance art, multi-media installations, and a rich legacy of paintings and sculpture that has brought him international recognition. His work has a strong, demanding presence. His painting is an unusual combination of mystical naivet⁄ and almost scientific hyper-realism. You know you're seeing something you haven't seen before, but you can't easily say what it is. The intensity of Alex Grey's visionary art is an unexpected shock. He writes in his new book, The Mission of Art: Visionary art is the creative expression of glimpses into the sacred unconscious, spanning the most searing shadow imagery of tortured souls in hell, the mythic archetypes of demonic and heroically compassionate forces that seem to guide and influence our feelings, and the luminous transpersonal heaven realms. Visionary art offers bizarre and unsettling insights, convincing us by its compelling internal truth. As he put it more simply in our interview, I am in the pickle of a contemporary artist attempting to personally experience the transcendental and bring that into the work. Early in his career, he mostly abandoned painting and turned to performance art to clarify and expand his artistic goals. He created many controversial performance pieces, some of which he now considers morally ambiguous, even unethical. Like a shaman praying to be possessed, he was always physically at the center of these pieces, often using materials that no one would get near, his morbidness, his seriousness, his obsessiveness, all nakedly exposed. Sometime in the late seventies, Grey began to take psychic risks on his path of art that went beyond public notoriety and controversy. He confronted demons and angels within himself, going to the edge of a dark abyss of insanity and absolute evil. Answering to his fears, a deep spiritual conscience was aroused within him. Humble and receptive, he vowed to make more positive statements with his art, turning away from an almost pathological nihilism to a more redemptive idealism and spirituality. This profound decision has left a lasting mark on his art of the last twenty years. So has meeting his wife Alyson, a painter, who has collaborated on many of his projects and whom he considers a gift of god on his artistic path. Grey seems to have an insatiable curiosity about the human mind and its mysteries, the human soul and its mission, and God, not to mention space, matter and energy. He is a thoroughly modern man who celebrates the way of artistic understanding in the sacred traditions of the past, as well as in the most advanced technologies of today. An art of universal spirituality, acknowledging all spiritual paths, drawing upon the image bank of the world and not from the limits of one culture over another, this is what Alex Grey is working toward. 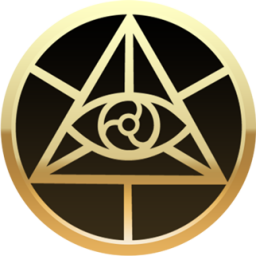 Discovering the sacred truths that underlie all the wisdom traditions, accessing transpersonal archetypes in vision states and bringing them back for us in the most authentic and iconic way possible, this is, in his words, his mission as an artist. What is your understanding of sacred art? I think the mission of art is to embrace some personal sense of the transpersonal. Sacred art crystallizes a kind of revelatory power that reinforces our own sense of the depth of the meaning of life and our predicament here. When art can do that, not just expressing the small self, but expressing the larger collective soul and helping to entrain people to a greater reality, it's beneficial. Art looks at the deepest level, which involves intensive self-examination and examination of the world, so that one can gear into spiritual domains. Art is a reflection of who we think we are and what a culture is. It's a reflection of cultures and individuals, and how they resonate. Art is the way a culture embeds its sacred truths so that they can be passed on, either the next day or centuries from that time. It's the way we have preserved our cultural memory of who and what we are. How is this view reflected in your own art? My art is related to the visionary tradition of the sacred arts. I spend months, if not years, on a work which is based on a flash of a vision that can occur in less than a minute. There is a lot of time in my work that's spent in self-examination, although not in a morbid sense. I hope that the energy embedded in the work brings about some kind of self-reflection in the viewer, and perhaps crystallizes a complex of forces for them, as it did for me in the moment that I had the vision. I want to bring the viewer back to that spot, to the initial vision, and lay it gently in their stream of consciousness to dissolve over time or collect thought-energy, if that's useful. But imagery in our culture is now so plentiful, there's endless generation of photography, clip-art, video, film, that keeping focused on the vision is a struggle. It becomes devotional labor, not unlike the labor in other sacred art traditions such as Tibetan thangka painting or Christian icon painting, requiring much time to complete. My labor is to pray, bring forward my best, and to keep on conforming to the image of my vision. You did not begin your artistic career with this kind of goal. My teenage and post-adolescent world view was permeated by a sense of the absurdity of existence. The meaninglessness of life was something that was very strong in me, and I struggled existentially with the question: what is art? In the early seventies I came upon the performance art scene. It was a time of radical experimentalism. You could have yourself shot in the arm or slaughter a calf and spill its guts all over people, and call it art. If the artist called it art, it was art. Picasso was sort of the father of this tireless experimentalism, the constant reinvention of art, which in some sense mirrors scientific invention in the twentieth century. As contemporary artists we are inheritors of this tireless experimentalism. Yet I've come to see the search for new forms, of Art for art's sake, as a shallow reason to perform and work. Is this how you see most art today? All the forces of tradition and the history of art come like a locomotive into the mind of a young artist. What is he or she supposed to do? Nowadays the artist has the widest range of possible modes of expression. Instead of tireless experimenting, I say, bring back the artist to what they are doing. Ask them: why are you making what you are making? What is the sense of it all? This time of experimentation, modernism, post-modernism, all the previous romantic and impressionist and other approaches, had to do with the engagement of the artist with themselves, to individuate them from their culture, in a sense. This rebellion was necessary to establish art as a free agent of expression, not tied to one ideology or another. Art was an agency whereby you could be totally free to express who or what you are or aren't. As egoic as it is, that is modernism's hard won freedom, but it comes with no sort of requirements of conscience or consciousness. In light of that, do you have hope that sacred art has a future? I think our task in the twentieth century has been to integrate the Eastern and Western approaches to our path in art. We're at a time when we can access the many spiritual paths, each of which has a unique kind of sacred art. Today, artists are collaborating with each other all over the world, and there's potential for a universal spiritual art, individually based but able to tap the archetypes of the collective. This work demands its own kind of sacred space, instead of a normal art gallery. There's a tremendous amount of religious art in a place like the Metropolitan Museum, it's seething with spiritual fervor, in a sense, but it is like a butterfly that's been pinned to the mount. It's not necessarily expressly placed there for its transcendent function. It's not specifically oriented toward that. I feel that creation of sacred space, sacred architecture for the sacred arts, is an essential move in the twenty-first century. This why I want to build a chapel I've been calling Enthion, a place to discover the spirit within. You could call it interfaith or post-denominational. It would be a place inclusive of all spiritual paths which addresses the transpersonal or spiritual reality through contemplation of works of art that elicit immersion in the transcendental ground of being. So the spiritual art of the twenty-first century and beyond can do these things, orient us to reverence for life and make a new kind of universal spiritual statement that underscores the value and meaning of life. I think that's what's to come.